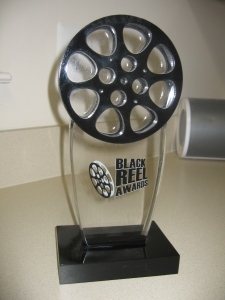 Washington, DC — This evening in the Nation’s Capital, the 14th Annual Black Reel Awards handed out their prizes for the finest accomplishments and achievements of African-Americans and people of the African Diaspora in feature and independent films and television in 2013. The runaway winner of the night was 12 Years a Slave, the harrowing story of a free black man who is kidnapped from his Northern home and family and forced into more than a decade of soul-consuming slavery. The film won an astonishing eight awards, besting previous record-holder, Precious. They included: Outstanding Motion Picture, outstanding actor for Chiwetel Ejiofor, Outstanding Supporting Actress for dazzling newcomer Lupita Nyong’o, who also won Outstanding Female Breakthrough Performance, Outstanding Director for Steve McQueen, Outstanding Screenplay for John Ridley, Outstanding Ensemble, and Outstanding Score for unexpected maestro Hans Zimmer. The sole remaining acting awards went to Danai Gurira (Outstanding Actress) for her role in Mother of George. Captain Phillips’ Barkhad Abdi nabbed both Outstanding Supporting Actor and Outstanding Male Breakthrough Performance. 12 Years a Slave wasn’t the only heralded film. 20 Feet from Stardom, about the oft-ignored world of backup singers, won Outstanding Documentary, while The New Black took Outstanding Independent Documentary. War Witch, from Canada, grabbed Outstanding Foreign Film. Outstanding Independent Feature went to Blue Caprice. “Desperation,” by Judith Hill, from the documentary 20 Feet from Stardom, won Outstanding Original Song, while another star using his voice wow audiences—Samuel L. Jackson—snagged Outstanding Voice Performance for his part in the animated film, Turbo. Outstanding TV Movie Screenplay went to Mara Brock Akil’s Being Mary Jane, while veteran film and television helmer, Spike Lee, won Outstanding Director for Mike Tyson: Undisputed Truth.